The Garmin Fenix 5X Plus multisport GPS watch is for athletes and adventurers alike! Equipped with wrist-based Pulse Ox acclimation sensors, Pre-loaded mapping, Smart Notifications, Tracking and more- the Fenix 5X is sure to exceed your expectations. The Garmin Fenix 5x Plus is a high-performance GPS watch featuring a multitude of activity related, entertainment and guidance centered features. Rugged in design, the 5x Plus watch is waterproof (10 ATM) and boasts a scratch resistant domed sapphire lens. Multi-satellite network capability is a unique feature of the Fenix Plus, using GPS, GLONASS and Galileo satellites to provide the most accurate GPS position possible. Wear your watch and go. Garmin Pay Contactless Pay allows users to make payments directly from their Garmin watch so there is no need to haul cash and cards during a run or while adventuring. 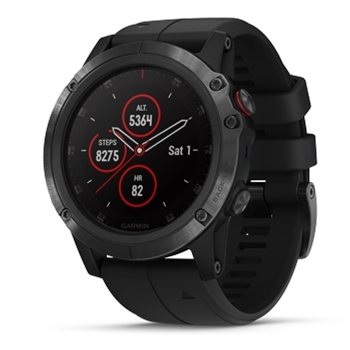 WiFi enabled, the Fenix 5X Plus can automatically upload your information to Garmin Connect so you can store records of your activities in one central place without having to manually offload information. How about some entertainment? Store and play up to 500 songs on your watch through Bluetooth headphones (sold separately). 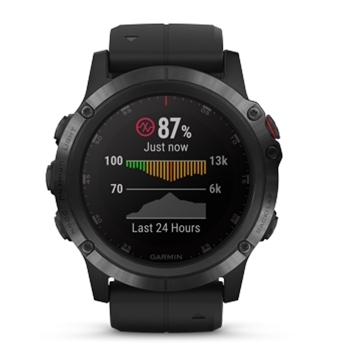 The Fenix 5x Plus offers Trendline Popularity Routing which uses Garmin Connect Data in order to suggest the best trails and paths for hiking, biking or walking, No need to carry an additional handheld GPS as the 5x PLUS has preloaded Topo mapping, at a glance guidance (ie. turn at Smith Avenue), and the ‘Around Me’ feature which provides points of interest near you. Connected features including smart notifications allow you to stay in touch directly from your watch, providing family and friends with peace of mind. This feature is further honed with Garmin GroupTrack which enables family and friends to track your travels in real time. It’s easy to track your health stats with the Fenix Plus. Elevate wrist based heart rate allows for monitoring without a chest strap. Garmin’s Wrist-Based Pulse OX Sensor is specific to the 5X Plus and provides blood oxygen saturation tracking. The sky’s the limit when it comes to personalizing your 5x Plus. Select from a wide range of apps, widgets, data fields and watch faces at the Garmin Connect IQ Store. Garmin's HRM-Tri Heart Rate Strap is designed for Tri-Athletes and stores Heart-Rate Data even when under water. 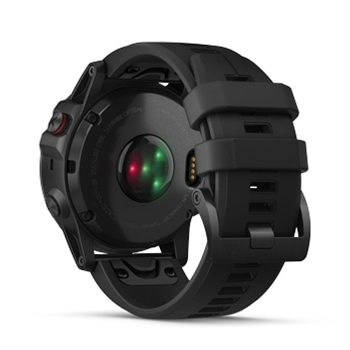 The smallest and lightest of Garmin's Heart Rate Monitors the HRM-Tri can be used during Bike Rides, Runs and Swims. Garmin’s VIRB 360 is Garmin’s newest Action Camera. Record your adventures with 360-degrees of video at the touch of a button or voice-command. Simple editing through the Hyperframe Director Mode and the free Garmin VIRB App, 4-built in microphones and 1-click stabilization make this action camera user friendly while offering a high quality of picture. Garmin Carry Case for Forerunner Series, Edge Series, Approach Series and fenix Plus Series.